CalcNote 2.5 is a calculator, notepad , converter unit and month calendar in one. CalcNote emulates standard desktop Calculators, Notes, Converter Unit, Month Calendar. 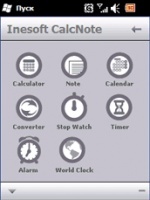 However, CalcNote features some extra functions that are very helpful when used in a Pocket PC. CalcNote Windows Mobile software was developed with the peculiarities of Pocket PCs in mind. It doesn't cover the whole working area of the screen and can be easily moved to any place. You can change the size of CalcNote with one click, and it doesn't capture the keyboard focus from other programs. CalcNote is a lot like your desk: along with business documents, there is always a sheet of paper, pen and calculator at hand. CalcNote enables you to write down information and make necessary calculations that can be synchronized with financial management software programs such as Pocket Quicken or Windows Mobile Money. Typical cases of CalcNote usage. Sometimes you need to write down quickly some phone number or address. Your interlocutor may not like waiting for you to run you Pocket PC, open Contact application, make new entry and enter phone number in the appropriate field. It's much easier to click the CalcNote icon, press the New button to create a new note and write down the number or draw an approach plan manually. CalcNote will automatically name the note using the first line of the text and save the note on the PC. Thus, you can create notes quickly without being afraid that some of them will be missed. In your spare time, you can rewrite your notes into the appropriate program, classify the information and delete unneeded note from your computer. Sometimes it's very important to make calculations quickly. For example, you've got e-mail containing figures to be calculated. Of course you can switch into your standard calculator that will cover the whole screen and the e-mail with the important information, but it's not the best way. It's more convenient to click once the CalcNote icon - a calculator that covers only one fourth of the screen will be opened. You still can see the figures in the e-mail - you can easily write them down or copy them into the calculator, make necessary calculations and then copy the result to any of the programs.